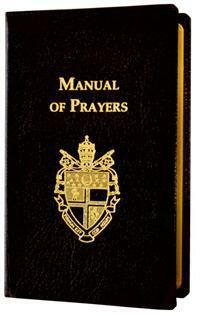 The Manual of Prayers contains a wealth of prayers, litanies, novenas, and meditations, and makes a thoughtful gift! This fine introduction to the Church's rich devotional legacy is widely used by the students and faculty of the North American College in Rome. It includes an extensive collection of prayers drawn from the Liturgy and the writings of the saints. Also includes prayers before and after Mass, morning and evening prayers, prayers to the Blessed Virgin Mary and Saint Joseph as well as prayers of various other saints, prayers of petition, chants, and more.